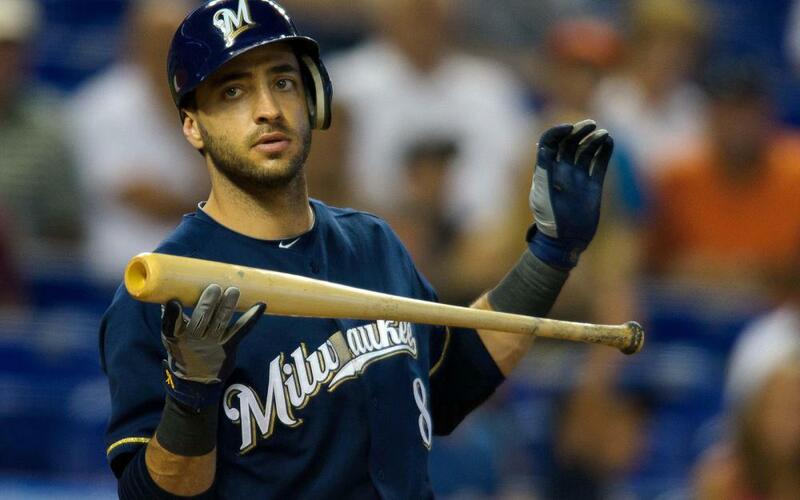 Ryan Braun has been dealing with a back injury this week but was able to return to the lineup on Friday. He went 1-for-3 with a run and a RBI in his return to the lineup. .... Lorenzo Cain injured his intercostal on Tuesday and has been held out of the lineup since. Christian Yelich has slid over to centerfield to fill in for Cain and Curtis Granderson has started in left field in the two games since Tuesday.... Tommy La Stella has been dealing with a back injury that forced him to stay back in Chicago while the team traveled to Arizona for their series against the Diamondbacks..... Kyle Schwarber returned to the lineup on Friday as a DH as the Cubs are easing him back after his back injury. Ben Zobrist and Kris Bryant rotated in LF with Zobrist shifting to RF against lefties with Jason Heyward heading to the bench.... Wilmer Flores will miss the rest of the season as he's been diagnosed with arthritis in both of his knees. Flores told reporters that his knees have been bothering him for a while and finally got to the point where he needed to be shut down. Domonic Smith has been the main first baseman with Jay Bruce spelling him from time to time..... Maikel Franco returned to the Phillies on Friday but was limited to pinch hitting duties and he went 1-for-1 with a RBI..... Trevor Story still isn't a full go yet with his elbow injury, but he was able to swing the last few days and says that he would be able to pinch hit if needed in a big situation. He may not be 100% but says that he may be able to change his throwing motion to make throws from shortstop.... David Wright is scheduled to return to the Mets on the 29th and start that day against the Braves. Wright is then going to retire upon the conclusion of the season. Wright getting back to play at all is a remarkable feat as he hasn't played in the majors since May of 2016.... Addison Russell has been placed on leave from the Cubs as allegations have resurfaced against the shortstop of domestic violence from his ex-wife. This is the second time allegations have come up against the shortstop and it'll be a situation to watch over the offseason if he faces suspension come next season. Javy Baez is playing shortstop in his absence. Jose Urena exited his last start with a hand cramp and he's slated to take the mound Saturday for the Marlins..... Zach Wheeler has been shut down for the rest of the season after hitting his innings limit for the team. Bud Norris has been dealing with a finger injury but was reportedly available Friday to pitch, but he wasn't used. Carlos Martinez has picked up four saves this month while Norris has been in and out of the closing role..... Seung Hwan Oh pitched an inning on Wednesday, his first action on the mound since September 9th. Catcher - Jorge Alfaro has posted a 190 wRC+ over the last two weeks with a .313 ISO in eight games. We've seen flashes of his incredible upside this year, and his defensive skills behind the plate will keep him in the lineup. Austin Hedges is showing some pop behind the plate with three homers in his last 10 games while recording a sub-10% strikeout rate. Francisco Cervelli has been ice cold for the Pirates with a 28 wRC+ and a .042 ISO. First Base - Josh Bell has been on fire for the Pirates lately with two homers and a steal in his last 11 games while hitting .436. The hot streak has brought his wRC+ for the season up to 116, which is a career high. Freddie Freeman has had a slow second half for the Braves but has gotten hot lately with a 168 wRC+ in the last two weeks. He's homered twice and has even tacked on two stolen bases which pushes him up to 10 for the season, a new career high. Matt Carpenter has cratered in September after having one of the most incredible summers that we have seen in recent years. In his last 51 plate appearances he's slashing just .143/.275/.175 with no homers. 12 runs in 12 games is the only thing that's been somewhat redeeming for him lately. Anthony Rizzo has also been ice cold for the Cubs with a 22 wRC+ over the last two weeks. Like Carpenter, Rizzo has also failed to provide power lately with a .000 ISO. Second Base - Jeff McNeil has continued to have an extremely strong final month of the season with a 154 wRC+ over his last 61 plate appearances. He's posting incredible contact rates but the .351 average is definitely being helped by his .388 BABIP. Ozzie Albies has struggled in the second half with a 74 wRC+, though it's been slightly better in the last couple weeks with a 99 wRC+. He homered on Friday for the first time since September 3rd. Third Base - Anthony Rendon has been absolutely mental in the second half and that's continued with four homers in the last two weeks. He's slashing .373/.459/.686 and has as many walks as strikeouts. Charlie Culberson has been great as a bench bat for the Braves and he's filled in well for Johan Camargo while he missed some time last week, posting a 148 wRC+ over his last 26 at bats. He's basically an injury replacement right now but the clinched the East Saturday and he could be in line for some extra ABs in the last week if they decide to rest players. Camargo has struggled for the last two weeks with a 38 wRC+, but he also hasn't been 100% healthy in that span. Mike Moustakas has gone could for the contending Brewers with a 75 wRC+ in the last two weeks. Shortstop - Amed Rosario has had a very strong second half and has two homers and three steals over the last two weeks to go along with 11 runs scored. He's been the primary leadoff hitter for the Mets and should be a good source of runs over the last week of the season. Trea Turner has been one of the few elite base stealers this season and he's swiped five bags in the last 13 games. Dansby Swanson has fallen off of his hot stretch and has a 51 wRC+ and two runs scored. Johnathan Schoop has been struggling for the Brewers lately with a .136 average and a 41% strikeout rate. Outfield - Michael Conforto has been on a tear for the Mets hitting six homers in the last two weeks with a .321/.406/.750 triple slash. In September as a while he owns a 165 wRC+ and has eight homers while driving in 24 runs. Rosario staying hot above him in the lineup will continue to help him with his production. Domingo Santana has a .769 ISO in the last 11 games but he's been primarily used as a pinch hitter as he has just 13 at bats. If Lorenzo Cain's injury lingers over the next week he could provide solid pop in his limited playing time. Franmil Reyes has homered 16 times this season to go along with a .285/.343/.526 triple slashing and is hitting .421 in his last 44 at bats. That's being entirely fueled by a .521 BABIP, but with a week to go in the season it's time to ride the hot hands in fantasy. Carlos Gonzalez has had a solid season for the Rockies but he's been ice cold lately sashing .111/.172/.148 in his last 29 plate appearances. Nick Markakis is in a cold stretch as well with a 64 wRC+ over 13 games. He would definitely be a beneficiary of a day or two off next week as the Braves have clinched the NL East. Starting Pitching - German Marquez continues to dominate and owns a 2.70 ERA (1.81 FIP) over his last three starts with a 33% K% against just a 2.6% BB%. His second half as a whole has been remarkable with a 2.17 FIP in 81 innings. Cody Reed has turned in back to back gems with 11 scoreless innings while striking out 16 batters. In that span he's generating a 17% swinging strike rate which is far above the 10.8% numbers he's posted for the season. Luis Castillo is in the middle of another dominant stretch, but he currently owns a 96.8% strand rate and that number just isn't sustainable. A pair of Braves' arms have been playing with fire lately. Julio Teheran has a respectable 3.86 ERA in his last 16.1 innings, but he owns a 5.9% HR/FB rate on a 43% FB rate which screams that a regression game is coming. He also continues to walk people at a remarkably bad rate at 18.3%. Sean Newcomb also has struggled as of late, allowing five or more runs in four of his last seven starts. His next turn through the rotation is going to be skipped according to the Braves (likely Touki Toussaint will get that start). Touki Toussaint should get a start next week as the Braves will likely begin to manipulate the rotation to get the playoff rotation ready (Likely starting with Mike Foltynewicz game one). Toussaint has pitched well for the Braves this year despite running into some walk issues his last few times out. He's walked 12 batters over his last 12.1 innings but the big walks game came in a bullpen appearance where he walked four batters in an inning. He's struck out a batter an inning so far this year and has a 50% ground ball rate. The Braves have no probable starters listed on their website currently but both the Mets and the Phillies would be a good matchup for the righty. As noted above, Cody Reed is absolutely dominating right now and he's lined up for one more start this season. He's currently slated to start Wednesday against the Royals who own a collective 80 wRC+ against southpaws this season. Reed was a highly regarded prospect in the Reds system and it appears that he's finally beginning to piece it all together. Paul Dejong has just this week creeped over the 50% ownership mark as he's picked up a hit in 13 of his last 14 games with three homers in that span. Over this span he's hitting .300 with a .240 ISO, having regained his power stroke after missing a chunk of the season with a broken hand. Middle infield pop can be hard to come by, especially this late in the season, and there's a decent chance that Dejong is currently sitting on your waiver wire.